2005-03-15 Application filed by Tomtom B.V. filed Critical Tomtom B.V.
An in-car navigation device depicts dynamic travel information (congestion, weather, etc.) in the context of a schematic display of the actual roads that the information relates to. In one implementation, the schematic view is a linear representation of the route and that schematic linear representation is displayed at the same time but separate from a map of a 2-D or 3-D representation of the actual road being traveled along the current location of the device on that road. The device can send a request to a remote server over a wireless communication network for dynamic travel information relevant to a defined route and receive and display that information. This invention relates to a navigation device that can display dynamic travel information. Dynamic travel information is updated information about road driving and traffic conditions, such as information about congestion, road blocks, adverse weather etc. on particular routes. The information is dynamic in the sense that it can change. The information displayed on the device is ideally completely up to date, although in practice there is some time delay between observing and reporting on road and traffic conditions and receiving those reports at the device. The device finds particular application as an in- car navigation system. GPS based navigation devices are well known and are widely employed as in-car navigation systems. Reference may be made to the Navigator series software from the present assignee, TomTom B.V. This is software that, when running on a PDA (such as a Compaq iPaq) connected to an external GPS receiver, enables a user to input to the PDA a start and destination address. The software then calculates the best route between the two end-points and displays instructions on how to navigate that route. By using the positional information derived from the GPS receiver, the software can determine at regular intervals the position of the PDA (typically mounted on the dashboard of a vehicle) and can display the current position of the vehicle on a map and display (and speak) appropriate navigation instructions (e.g. 'turn left in 100 m'). Graphics depicting the actions to be accomplished (e.g. a left arrow indicating a left turn ahead) can be displayed in a status bar and also be superimposed over the applicable junctions/turnings etc in the roads shown in the map itself. Reference may also be made to devices that integrate a GPS receiver into a computing device programmed with a map database and that can generate navigation instructions on a display. The term 'navigation device' refers to a device that enables a user to navigate to a pre-defined destination. The device may have an internal system for receiving location data, such as a GPS receiver, or may merely be connectable to a receiver that can receive location data. Reference may be made to US 5612881, which shows an in-car navigation device that can display a schematic representation of the entire journey and can display estimated arrival times at various points on the journey. Dynamic travel information is not however included in the display at all. Superimposing dynamic travel information onto a navigation map is however known from US 5831552, US 5694122 and US 5864305. In-car navigation systems may have access to real-time updated travel information; for example, in the Smartnav™ system from TrafficMaster pic, a central server receives real time updated traffic information from sensors located by the roadside of the UK road network. The server calculates routes to be followed, given a driver's start and destination address, and sends that route information to an in-vehicle device which speaks appropriate instructions to the driver (hence, there is no map display as such). When congestion etc. is spotted that is relevant to a particular driver's route, the server can send a message to that driver's navigation device, which is then relayed as an audio alert to the driver. Superimposing dynamic travel information onto a navigation map generated and displayed by an in-car navigation device is also known from US 5831552, US 5694122 and US 5864305. In a first aspect, there is a navigation device programmed with a map database and software that enables a route to be planned between two user-defined places, in which the device is further programmed (i) to be able to calculate and to display a 2-D or 3-D representation of the actual road being travelled along and the current location of the device on that road and (ii) to receive and process dynamic travel information relating to the route; wherein the device is adapted to calculate and to display a schematic view showing at least the remainder of the entire route, the schematic view appearing on a single screen and including dynamic travel information relating to the route and,. The present invention hence moves away from the established approach of integrating dynamic (e.g. changing or updated) travel information direcdy onto the 2-D or 3D navigation map representation. By calculating an entirely separate schematic view of at least the remainder of the route and displaying that view on a single screen, it enables the user to immediately see at a glance if there are major delays etc. anywhere on the proposed route. Previously, it was very difficult for the user to see at a glance whether any major traffic incidents affected the route: he would have for example to scroll through a list or 2D display of the entire route, perhaps involving many separate interactions with the device. In one implementation, the schematic view is a linear representation of the route or the remainder of the route not yet travelled along. Icons representing different travel disturbances (e.g. traffic jams, ice etc.) can be placed on this linear representation; the device uses the approximate distance to the disturbance to place it at the correct position on the linear representation. An icon may be displayed that represents how recendy the dynamic travel information was received by the device: this is especially useful for traffic information since the user will often wish to know how up to date the information is. Also, the user can request updated dynamic travel information by selecting an appropriate function displayed on the device; the 'data freshness' icon serves as a useful indication as to when that may be useful. The dynamic travel information may be displayed at the same time as the 2-D or 3-D representation of the actual road being travelled along; for example, in a separate window to one side of the main navigation map. This separate section could be always shown when the navigation map is shown, or it could be shown only when an option to display dynamic travel information has been selected by the user. Alternatively, it may be displayed only on a different screen from the main navigation map; for example, the user tasks away from the screen showing the navigation map to a screen showing the schematic display. Figure 15 is a diagram of the electrical subassemblies in the Figure 14 navigation device. The present invention is implemented in software from TomTom B.V. called Navigator. Navigator software runs on a touch screen (i.e. stylus controlled) Pocket PC powered PDA device, such as the Compaq iPaq. It provides a GPS based navigation system when the PDA is coupled with a GPS receiver. The combined PDA and GPS receiver system is designed to be used as an in-vehicle navigation system. The invention may also be implemented in any other arrangement of navigation device, such as one with an integral GPS receiver/computer/display: Appendix 1 is a description of such a device. It may also be implemented as a device designed for non-vehicle use (e.g. for walkers) or vehicles other than cars (e.g. aircraft). The navigation device may implement any kind of position sensing technology and is not limited to GPS; it can hence be implemented using other kinds of GNSS (global navigation satellite system) such as the European Galileo system. Equally, it is not limited to satellite based location/velocity systems but can equally be deployed using ground-based beacons or any other kind of system that enables the device to determine its geographic location. Navigator software, when running on a PDA, results in a navigation device that causes the normal navigation mode screen shown in Figure 1 to be displayed. This view provides driving instructions using a combination of text, symbols, voice guidance and a moving map. Key user interface elements are the following: a 2-D map 1 occupies most of the screen. The map shows the user's car and its immediate surroundings, rotated in such a way that the direction in which the car is moving is always "up". Running across the bottom quarter of the screen is the status bar 2. The current location of the, device, as the device itself determines using conventional GPS location finding and its orientation (as inferred from its direction of travel) is depicted by an arrow 3. The route calculated by the device (using route calculation algorithms stored in device memory as applied to map data stored in a map database in device memory) is shown as darkened path 4 superimposed with arrows giving the travel direction. On the darkened path 4, all major actions (e.g. turning corners, crossroads, roundabouts etc.) are schematically depicted by arrows 5 overlaying the path 4. The status bar 2 also includes at its left hand side a schematic 6 depicting the next action (here, a right turn). The status bar 2 also shows the distance to the next action (i.e. the right turn - here the distance is 220 meters) as extracted from a database of the entire route calculated by the device (i.e. a list of all roads and related actions defining the route to be taken). Status bar 2 also shows the name of the current road 8, the estimated time before arrival 9 (here 2 minutes and 40 seconds), the actual estimated arrival time 10 (11.36am) and the distance to the destination 11 (1.4Km). The GPS signal strength is shown in a mobile-phone style signal strength indicator 12. A 3-D map view is also possible, as shown in Figure 2. If the user touches the centre of the screen 13, then a navigation screen menu is displayed; from this menu, other core navigation functions within the Navigator application can be initiated or controlled. Allowing core navigation functions to be selected from a menu screen that is itself very readily called up (e.g. one step away from the map display to the menu screen) greatly simplifies the user interaction and makes it faster and easier. The area of the touch zone which needs to be touched by a user is far larger than in most stylus based touch screen systems. It is designed to be large enough to be reliably selected by a single finger without special accuracy; i.e. to mimic the real-life conditions for a driver when controlling a vehicle; he or she will have litde time to look at a highly detailed screen with small control icons, and still less time to accurately press one of those small control icons. Hence, using a very large touch screen area associated with a given soft key (or hidden soft key, as in the centre of the screen 13) is a deliberate design feature of this implementation. Unlike other stylus based applications, this design feature is consistendy deployed throughout Navigator to select core functions that are likely to be needed by a driver whilst actually driving. Hence, whenever the user is given the choice of selecting on-screen icons (e.g. control icons, or keys of a virtual keyboard to enter a destination address, for example), then the design of those icons/keys is kept simple and the associated touch screen zones is expanded to such a size that each icon/key can unambiguously be finger selected. In practice, the associated touch screen zone will be of the order of at least 0.7 cm2 and will typically be a square zone. In normal navigation mode, the device displays a map. Touching the map (i.e. the touch sensitive display) once (or twice in a different implementation) near to the screen centre (or any part of the screen in another implementation) will then call up a navigation menu (see Figure 3) with large icons corresponding to various navigation functions, such as the option to calculate an alternative route, and re-calculate the route so as to avoid the next section of road (useful when faced with an obstruction or heavy congestion); or recalculate the route so as to avoid specific, listed roads. The actual physical structure of the device itself may be fundamentally no different from any conventional handheld computer, other than the integral GPS receiver or a GPS data feed from an external GPS receiver. Hence, memory stores the route calculation algorithms, map database and user interface software; a microprocessor interprets and processes user input (e.g. using a device touch screen to input the start and destination addresses and all other control inputs) and deploys the route calculation algorithms to calculate the optimal route. 'Optimal' may refer to criteria such as shortest time or shortest distance, or some other user-related factors. More specifically, the user inputs his start position and required destination in the normal manner into the Navigator software running on the PDA using a virtual keyboard. The user then selects the manner in which a travel route is calculated: various modes are offered, such as a 'fast' mode that calculates the route very rapidly, but the route might not be the shortest; a 'full' mode that looks at all possible routes and locates the shortest, but takes longer to calculate etc. Other options are possible, with a user defining a route that is scenic — e.g. passes the most POI (points of interest) marked as views of outstanding beauty, or passes the most POIs of possible interest to children or uses the fewest junctions etc. Roads themselves are described in the map database that is part of Navigator (or is otherwise accessed by it) running on the PDA as lines — i.e. vectors (e.g. start point, end point, direction for a road, with an entire road being made up of many hundreds of such sections, each uniquely defined by start point/ end point direction parameters). A map is then a set of such road vectors, plus points of interest (POIs), plus road names, plus other geographic features like park boundaries, river boundaries etc, all of which are defined in terms of vectors. All map features (e.g. road vectors, POIs etc.) are defined in a co-ordinate system that corresponds or relates to the GPS co-ordinate system, enabling a device's position as determined through a GPS system to be located onto the relevant road shown in a map. Route calculation uses complex algorithms that are part of the Navigator software. The algorithms are applied to score large numbers of potential different routes. The Navigator software then evaluates them against the user defined criteria (or device defaults), such as a full mode scan, with scenic route, past museums, and no speed camera. The route which best meets the defined criteria is then calculated by a processor in the PDA and then stored in a database in RAM as a sequence of vectors, road names and actions to be done at vector end-points (e.g. corresponding to pre-determined distances along each road of the route, such as after 100 meters, turn left into street x). In addition, a graphical icon representing road works is also shown, indicating the exact location of the road works on a particular road. Figure 4 shows how the map can be zoomed in using normal zoom controls, such as slider bars; Figure 5 is at an even higher zoom level. Figure 6 shows how dynamic traffic information can be incorporated into a ticker at the bottom of the status bar. Figure 7 shows how the device can also compute and display a schematic view showing the entire route on a single screen; this is the vertical linear representation 71 running along the left hand side of the screen. It therefore accompanies the normal navigation map view (2-D or 3-D) showing the actual road being travelled along and the current location of the device on that road. All of the major roads forming the route are displayed here; for complex routes involving large numbers of different roads, the device is programmed to prioritise roads for display according to length (in the absence of significant dynamic travel information); if any road on the route has dynamic travel information associated with it, then that road will be included in the schematic 'entire route' representation as a priority. Hence, the constituent elements in this linear representation can alter during the journey as new travel information is received by the device (a later section will describe how dynamic travel information is generated at a remote server and sent to the device). In any event, the schematic linear view of the route (just like the schematic non-linear, map based view of the route in Figures 3, 4 and 5) has superimposed over some of its constituent roads colour coded arrows, again indicating in the same way traffic flow conditions at the overlaid sections of the road using the Figure 11 coding. A more simplified schematic view, showing just the remainder of the route is also possible, as shown in Figure 8A. In Figure 8A, the vertical bar 80 (on the right) linearly represents the route from the current position to the destination; i.e. the remainder of the route. Any icon(s) on the bar show the start of traffic incidents (in the image, icon 81 represents a traffic jam). A fine line (red in an actual implementation) indicates how far the traffic jam stretches. At the top of the bar, a symbol 82 indicates how recent the traffic information is: in this implementation, a full green ball indicates the data is less than a minute old. After a minute, the indicator will shrink (like a pie being eaten) until it is gone (indicating 30 minutes or older). Apart from graphical icons, it is also possible to use control or check boxes or names. Generally, graphical icons are preferred though. Each icon is positioned adjacent to the affected part of the route it relates to, schematically represented by the vertical linear representation of the entire route. If the user selects a graphical icon, then the device displays more detailed traffic information; the effect of selecting the 'road works' graphic icon indicating road works on the A2 road is shown in Figure 8B. Selection is achieved by touching the screen at an icon (once, or in some variants a double touch); as noted above, large touch screen activation zones are used - sufficiendy large (e.g. 0.7cm2 in area or more) to allow an icon to be reliably selected with a fingertip. The detailed information is not only a zoomed in view of the map view of the affected part of the A2 road, but also a textual description of the relevant incident ("In 2.8km, 3.4km of queuing traffic") and the estimated delay ("00.45 hours"). In addition, the device displays an 'avoid' option; if selected by touching the 'avoid' button, then the device automatically re-calculates a route that avoids the affected road. That entire route will then be . displayed as a schematic, linear representation, enabling the driver at a glance to check whether there are any traffic incidents or reduced traffic flow affecting any parts of the new route. Implicidy, if no incidents or congestion is shown, then the user can at a glance see that the entire route is a clear one. If instead of selecting the 'avoid' control option, the driver selects the 'road works' graphic icon again (either the one in the linear representation of the entire route, or the corresponding one in the zoomed in map showing the affected part of the A2), then the device displays more textual information and a larger, more zoomed in map view of the affected part of the A2 road, as shown in Figure 9. (a) calculate alternative route: 'plan around traffic jams'; (b) calculate alternative route without including a predefined extent of the road ahead - 'avoid roadblock'; (c) calculate alternative route without including a predefined road; (d) revert to original route. For option (c) above, Navigator shows graphical icons for three different roads with a cross through the icon; selecting any one of these initiates a route re-calculation and excludes the defined road. The menu of re-calculation options is itself dynamically updated; it shows the next 3 roads that have associated with them dynamic travel information (these are the ones that the driver is most likely to need to avoid). The device therefore selects roads to include as one of the three by including the next three roads on the route which have some kind of traffic incident or undesirable traffic flow. Hence, the user can very readily and efficiendy initiate a route re-calculation to avoid difficulties. Figure 13 is an overall system architecture view. It shows the navigation device 131 with a built-in wireless transceiver communicating with a remote, 'traffic' server 133. One implementation uses a GPRS transceiver, but any form of wireless communication is possible (GSM, SMS messages, other format of message). Using the GPRS capabilities of a mobile telephone by linking to that phone using a cable interface, Bluetooth or other short distance connection is also possible and eliminates the need for a cosdy internal GPRS receiver. 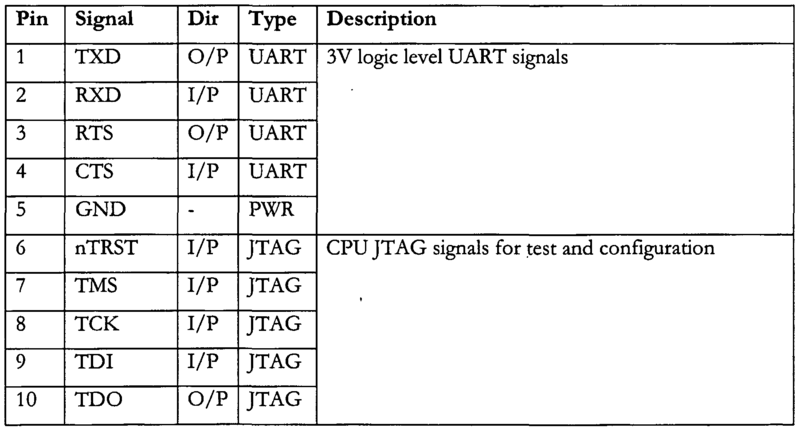 Appendix 1 describes one implementation called Go: this device includes a Bluetooth transceiver so that it can exchange data with a Bluetooth enabled mobile telephone or other device with long range wireless communications capabilities and hence indirecdy use those capabilities. The traffic server receives dynamic travel information from several data feeds 134 (in some countries, these are supplied by official, government bodies; in others, private organisations supply this data). The server 133 can receive any and all of these data feeds 134 and integrate them to build up as comprehensive a picture of dynamic travel information affecting all roads across one or more countries. Once a device 131 has calculated a route to a destination, it sends that route to the traffic server 133 over a GPRS cellular network 132, requesting that the traffic server 133 returns relevant dynamic travel information using a http request. The traffic server 133 then retrieves any relevant traffic information for any roads on that route and returns that information to the device 131 over network 132. That information may be itself geocoded (e.g. include WGC 84 format location data) to define the location to which the dynamic travel information relates. Alternatively, it may in fact not be geocoded, in which case the Navigator software running on the device 131 geocodes that data so that it can use it. For example, non-geocoded data could be in TMC (Traffic Message Channel) format and the device 131 then includes in memory TMC tables that it can look up in order to relate TMC location data to a location in the geocoded co-ordinate system that the device uses so that it can display the travel information at the applicable position on the map and the linear representation. TMC is also deployed in FM Radio Data System (RDS) and is used for broadcasting real-time traffic and weather information. The device 131 can regularly (or at pre-defined times or intervals) poll the traffic server 133 for updated dynamic travel information. Alternatively, the initial request for dynamic travel information can trigger the server 133 to automatically push updated dynamic travel information to the device 131 as and when it receives updated travel information of relevance. Another variant is for server 133 to continuously broadcast a repeating carousel of traffic information for all routes in a given area. Device 131 then listens at all times to this broadcast, detecting whenever dynamic travel information of relevance to its route is broadcast and then capturing and using that information. Because the device integrates dynamic travel information with a navigation program, it becomes far easier for a user to see if there are problems on a possible route and to recalculate that route to avoid those problems. Navigator facilitates route recalculation through a number of functions. Once a route has been re-calculated, a schematic of that route is displayed on the device together with dynamic travel information relating to that route; hence, the user can very quickly establish if the alternative route is better or worse than the original route. An implementation of the present invention facilitates access to functions that enable alternative routes to be calculated by placing a menu of graphical icons (or any other kind of way or option to allow selection of the functions, such as lists, check boxes etc.) on a menu screen that is easily accessed from the main navigation screen — i.e. the screen that is displayed during actual or simulated/preview navigation. As noted above, in normal navigation mode (and also the 'demonstrate route' mode for simulated/preview navigation — see later), the device displays an animated map that shows the location of the navigation device as the journey progresses. Touching the map (i.e. the touch sensitive display) once (or twice in a different implementation) near to the screen centre (or any part of the screen in another implementation) will then call up a 'Recalculate' menu screen (see Figure 10) with large icons corresponding to various navigation functions, such as the option to calculate an alternative route IOC ; re-calculate the route so as to avoid the next section of road 10A (useful when faced with a roadblock); and recalculate the route so as to avoid specific, listed roads 10B. The following sections describe these and other alternative route functions in more detail. Some of these functions may be initiated direcdy from the Recalculate menu screen; others may be at a deeper level in the menu structure. However, all can be initiated by selecting options such as graphical icons, lists, check boxes which are unambiguously associated with touch screen areas that are large enough to allow the user to select them with a fingertip whilst safely driving, typically at least 0.7cm2 in area. With this function, a user could select an 'avoid roadblock' function 10A that causes the system to recalculate a route on the basis that the road immediately ahead (or some user defined or system default distance ahead, e.g. 100 metres) is blocked. As noted earlier, a route planning algorithm in Navigator will work out an optimal route (optimal may refer to criteria such as shortest time or shortest distance, or some other factors) by exploring different routes and scoring them against the required criteria. In this way, one route which best meets the defied criteria is generated. If whilst actually driving along a route, an unexpected event occurs that requires the user to detour away from the pre-calculated route, such as a roadblock, the user can inform the Navigator software that his immediate road ahead is blocked and require the software to re- calculate a new route, taking his current position as a new starting position, but taking the first turning possible away from the old calculated route. This first turning might be ahead or behind the current car position. The system, in constructing the new route, explores a large number of possible routes to the destination from the current position, but excludes the road immediately ahead. Selecting the 'avoid roadblock' function 10A has to be fast and involve the absolute minimum number of screen interactions to minimise driver distraction. This can be achieved by the user being able to switch from normal navigation mode (in which the current position of the car is shown on a map, as shown in Figures 1 or 2) to a Recalculate menu mode, as shown in Figure 10, by pressing a key or selecting any point on the screen or selecting a given region of the screen. Where a given region has to be selected (e.g. the approximate centre of the map), then the touch activation zone is sufficiendy large that it can readily and reliably be selected by a user with his fingertip without needing to look carefully at the screen for more than a moment. A touch zone of 0.7cm2, centred on the map, has been found to be sufficient. The Figure 10 menu mode displays a small number of large icons, one of which is the 'avoid roadblock' 10A option. This can be selected with one touch; when this occurs, the software re-calculates the route and gives instructions in the normal manner (voice; and/or on screen navigation prompts) to allow the user to proceed to his destination but avoid the road immediately ahead. Alternative route function: 'avoid specific road' This function allows a user to easily and rapidly select a specific, named road 10B to mark as blocked so that he can use information from real time traffic information broadcasts on the radio. When listening to the radio, a user may hear that a specific road or perhaps part of a motorway between defined junctions is blocked or heavily congested. Alternatively, the device may receive dynamic travel information, e.g. from a remote server, which will provide data that certain roads are affected by congestion, adverse weather, other local incidents etc. If that road is on the user's calculated route, even though it might be many kilometres away, then he will want to have the software recalculate a new route as soon as possible. The next three such adversely affected roads are automatically listed on the Recalculate route menu Figure 10 to facilitate the driver selecting any of those roads as roads to be excluded from a fresh route re-calculation. The system does this recalculation by calculating a route to the final destination using the current position as a start position and exploring different routes to the destination, but excluding the road indicated as to be avoided. The new route will then be calculated using normal route planning algorithms and the user diverted onto the new route. Selecting the 'avoid specific road' function 10 B has also to be fast and involve the absolute minimum number of screen interactions to minimise driver distraction. This can be achieved by the user being able to switch from normal navigation mode (Figures 1 or 2, in which the current position of the car is shown on a map) to a Recalculate menu mode as described earlier (e.g. selecting a given region on the screen); the Recalculate menu displays a small number of large icons, several of which are named roads 10B on the route which, if selected, can be selected with one touch; when this occurs, the software re-calculates the route and gives instructions in the normal manner (voice; and/or on screen navigation prompts) to allow the user to proceed to his destination but avoid the road immediately ahead. The device may have limited screen space to display many roads for exclusion; the Figure 3 implementation lists three. These three are selected using various weighting parameters (e.g. a prior history of the user wishing to avoid them; the next three major roads) or from dynamic, updated travel information received by the device from a traffic information data source, indicating that these are the next three roads on the route that are affected by traffic disturbance of some kind. A final 'original' option 10D allows the user to clear all earlier re-calculation inputs and re-calculate the original route. Alternative route function: auto generate A user can also simply select 'alternative route' 10C if he wants to see another possible route: the system then recalculates a route, not using at least 80% of the roads from the prior route. If that route is still unsuitable, the user can obtain another alternative route again by selecting again 'alternative route' IOC. A user can select 'normal', 'strict' and 'fast' planning modes: each results in different route planning algorithms being used that calculate the route either normally, or stricdy (which may take many minutes as a great many permutations are explored) or quickly, (which may take a few seconds only as many simplifying assumptions are made about the optimal route). Go is a stand-alone fully integrated personal navigation device. It will operate independendy from any connection to the vehicle. PDA or Internet connection. The emphasis will be on completeness and ease of use. Although Go is a complete personal navigation solution it is primarily intended for in vehicle use. The primary target market is anybody who drives a vehicle either for business or pleasure. Go. The UI will be designed so that all other operations are easily accessible through the pen based UI. There will also be a concealed hard reset button. Go architecture is based around a highly integrated single chip processor designed for mobile computing devices. This device delivers approximately 200 MIPs of performance from an industry standard ARM920T processor. It also contains all the peripherals required excluding the GPS base-band. These peripherals include DRAM controller, timer/counters, UARTs, SD interface and LCD controller. Figure 14 is the Go block diagram. Go will be powered from an integrated Li-Ion 2200 mAH rechargeable battery. This battery can be charged, and the device powered (even if the battery contains no charge) from an externally supplied +5V power source. This external +5V power source is supplied via the docking connector or a DC jack socket. This +5V supply will be generated from the vehicle's main supply rail or from a mains adapter externally. The device will be turned on and off by a single button. When the device is turned off the DRAM contents will be preserved by placing the RAM in self- refresh so that when switched on Go will resume from where it was switched off. 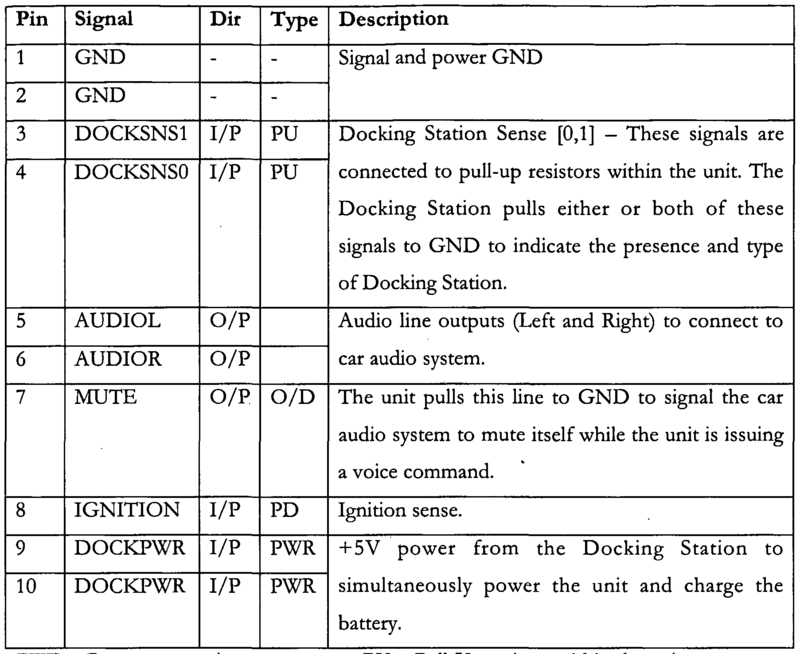 There will also be a wake-up signal available through he docking connector, this can be used to auto-switch on Go when the vehicle ignition is switched on. There will also be a small hidden reset switch. System Memory architecture In contrast to conventional embedded devices which execute all the OS and application code in place from a large mask ROM or Flash device, Go will be based on a new memory architecture which is much closer to a PC. In the Standard variant the Bluetooth function is not populated, and 32 Mbytes RAM is fitted. Bluetooth option (Future variant) The product design should include Bluetooth although it is not populated in the standard variant to minimise BOM cost. The design should ensure that all other functions (including GPS RF performance) operate without degradation when the Bluetooth function is operating. 64Mbyte RAM option (Future variant) The product design should ensure it is possible to fit 64Mbyte RAM instead of 32Mbyte. Subassemblies Go consists of the following electrical subassemblies, shown in Figure 15. RF cable The RF cable feeds the RF signal from an external GPS antenna (which connects to Go via the RF docking connector) to the RF PCB where the GPS module is situated. External connectors Docking Connectors Two Docking Connectors provide an interface to external Docking Stations. RF Docking Connector The RF Docking Connector allows connection of an external active GPS antenna via a Docking Station. AC adapter socket The AC adapter socket allows power to be supplied from a low cost AC adapter or CLA (Cigarette Lighter Adapter). USB connector The USB connector allows connection to a PC by means of a standard mini USB cable. The GPS internal antenna is attached direcdy to the RF PCB. When an external antenna is connected via the RF Docking Connector, the GPS antenna source is automatically switched to the external antenna. A solid state accelerometer is connected directly to the processor to provide information about change of speed and direction. A rising edge on the Docking Station IGNITION signal will wakeup the unit. The IGNITION signal may be connected to a 12V or 24V vehicle battery. The following optional peripherals will be available at or after the time of launch of Go • Active antenna kit. Contains a GPS active antenna and a docking shoe with GPS RF connector and cable fitted. For self installation when an external antenna is required. • Professional vehicle docking kit. For fitting by professional installation only. Allows direct connection to vehicle supply, audio system and active antenna via a vehicle interface box. 1. A navigation device programmed with a map database and software that enables a route to be planned between two user-defined places, in which the device is further programmed (i) to be able to calculate and to display a 2-D or 3-D representation of the actual road being travelled along and the current location of the device on that road and (ii) to receive and process dynamic travel information relating to the route; wherein the device is adapted to calculate and to display a schematic view showing at least the remainder of the entire route, the schematic view appearing on a single screen and including dynamic travel information relating to the route. 2. The device of any preceding Claim in which the schematic view is a linear representation showing the entire route or the remainder of the route. 3. The device of Claim 1 or 2 in which an icon is displayed that represents how recendy the dynamic travel information was received by the device. 4. The device of Claim 1 in which the dynamic travel information is displayed at the same time as the 2-D or 3-D representation. 5. The device of Claim 1 in which the dynamic travel information is only displayed at a different time from the 2-D or 3-D representation. 6. The device of any preceding Claim in which the dynamic travel information is a dynamic representation of traffic conditions. 7. The device of Claims 6 in which the dynamic representation of traffic conditions graphically represents the traffic flow direction. 8. The device of Claim 7 in which the dynamic representation of traffic conditions also graphically represents one or more of the following traffic conditions: (i) stationery traffic; (ii) queuing traffic; (iii) slow traffic; (iv) road closure or lane closure or road works. 9. The device of any preceding Claim in which the dynamic travel information is represented by a graphical icon or other kind of selectable option that represents one or more of the following: ® accident; (ϋ) traffic jam; (iii) road works; (iv) road closure; (v) general incident; (vi) lane closed; (v) heavy rain; (vi) strong winds; (vii) ice; (viii) fog. 10. The device of Claim 9 in which the option can be selected by touching the option, causing the device to display more details of the dynamic travel information associated with that option. 11. The device of any preceding Claim, wherein the user can, by touching a screen on the device, task away from the 2-D or 3-D representation of the actual road being travelled along to a menu screen which displays one or more options that, if selected through a further touch action, initiate a re-calculation of the route. 12. The device of Claim 10 or 11 in which the touch to the screen is a single or a double touch. 13. The device of Claim 12 in which the touch has to be at a region of the touch screen sized to be sufficiendy large to allow it to be reliably selected with a fingertip. 14. The device of Claim 13 in which the region is at least 0.7cm2 in area. 15. The device of Claim 11 in which the menu screen displays selectable options relating to one or more of the following functions: (a) calculate alternative route; (b) calculate alternative route without including a predefined extent of the road ahead; (c) calculate alternative route without including a predefined road; (d) revert to original route. 16. The device of Claim 9 in which each selectable option is one of the following: (a) a graphical icon; (b) a control or check box; or (c) a name. 17. The device of any preceding Claim that receives dynamic travel information using a receiver for a wireless network. 18. The device of Claim 17 in which the wireless network is a short range network established between the device and a mobile telephone, the mobile telephone obtaining the dynamic travel information over a cellular wide area network. 19. The device of Claim 17 or 18 in which the dynamic travel information sent to the device comprises geocoded data that defines the location to which the dynamic travel information relates. 20. The device of Claim 17 or 18 in which the dynamic travel information sent to the device comprises non-geocoded location data that defines the location to which the dynamic travel information relates and the software on the device geocodes that data. 21. The device of Claim 20 in which the non-geocoded data is in TMC format and the device includes in memory TMC tables that it can look up in order to relate the TMC format data to a location in the geocoded co-ordinate system that the device uses so that it can display the travel information at the applicable position. 22. The device of any preceding claim that can send a request to a remote server over a wireless communications network for dynamic travel information relevant to a defined route, the remote server (i) receiving dynamic travel information from one or more data feeds in relation to numerous roads and (ii) sending the dynamic travel information that is relevant to the defined route to the device in response to the request. 23. The device of Claim 22 that regularly or at pre-defined times or intervals polls the server for updated dynamic travel information. 24. The device of Claim 22 in which the request is an initial request for dynamic travel information and subsequently the server automatically pushes updated dynamic travel information to the device. 25. A method of displaying navigation information, the method being deployed in a navigation device programmed with a map database and software that enables a route to be planned between two user-defined places, in which the device is further programmed (i) to be able to calculate and to display a 2-D or 3-D representation of the actual road being travelled along and the current location of the device on that road and (ii) to receive and process dynamic travel information relating to the route; comprising the step of the device calculating and displaying a schematic view of at least the remainder of the entire route, the schematic view appearing on a single screen and including dynamic travel information relating to the route. 26. Computer software adapted to enable a navigation device, programmed with a map database and software that enables a route to be planned between two user-defined places, to: (i) be able to calculate and to display a 2-D or 3-D representation of the actual road being travelled along and the current location of the device on that road and (ii) receive and process dynamic travel information relating to the route; wherein the software calculates, and causes the display of, a schematic view of at least the remainder of the entire route, the schematic view appearing on a single screen and including dynamic travel information relating to the route.